Oh the legends told about the powers of Lavender! Said to remove tension, relieve pain of sore muscles and joints. Disinfectant. Clean and refreshing. Calming. Thought to lift anxiety depression and even headaches and migraines. Inhale the sense of wonder! Ingredients: Water. Saponified oils of palm, palm kernel, olive, sunflower, castor, sweet almond. 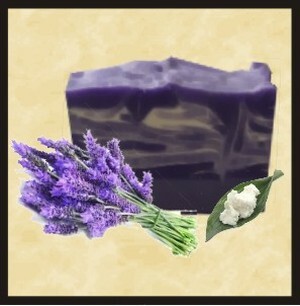 Shea butter, essential oil, confectioners sugar, lemon juice, aloe, vitamin E, natural color. Lavender was often associated with love & purity alike. If someone lost a loved one, they used lavender to heal the heart. It was also said to protect small children who would wear it on their shirts to “avert the evil eye”. A cross of lavender was hung on the door to safeguard against evil, and at childbirth, lavender & sandalwood were sometimes burned to ease the pain. Donning a lavender oil perfume was said to make it easier to go through menopause, or to relieve headaches or stress. Sometimes the flower was hung on bedposts for protection.